It is humbling to know anyone would think I would know anything about Ayurveda. Honestly, I don't. What I do know nevertheless is simple Indian home remedies, which almost every Indian household has. One such remedy is haldi ka doodh which translates into turmeric milk, which is simply that, turmeric (haldi) with milk (doodh). In a family of six, at least one of us would be suffering from cold and sore throat during winter. Everyone had to drink turmeric milk regardless of who was really sick. The minute the aroma of earthy turmeric and cardamom boiling along with milk hit our nostrils, we ran to our rooms and locked ourselves up. When mom finally knocked long enough to get us all out, we plugged our nose tight enough to avoid tasting the milk that almost instantly warmed and soothed the throat. Sometimes, mom would also add a little saffron to the milk, which made the milk more appealing to the eye apart from bettering the taste, but never added any sweetener. Turmeric, in recent years has attracted a lot of attention for its countless health benefits but for us Indians, it has always been a healing spice. It is a well known home remedy for skins problems, cold, chest pain, sore throat, toothache and many other ailments that every Indian mother trusts. Recent studies have even claimed it as substantial for curing diseases like cancer and Alzheimer's disease. Its undeniable how powerful this warm, bitter and almost peppery spice is. Even the sight of turmeric coloring and adding a beautiful golden hue to food it touches is as healing and therapeutic. Well, I can't say the same thing about my turmeric stained wooden cooking spoons, but they do become a part of daily Indian cooking and nothing much you can do about it. If there was anything worse than turmeric milk in our little young minds, it was the raw and fresh milk from the diary we got while on vacations in India. The raw milk smelled weird and we would tease our cousins, how we at least had milk that didn't smell so awful in Kuwait. Sweetener like honey, jaggery or regular sugar can be added to sweeten the milk. Heat the milk along with the spices for 2-3 minutes. Add the sweetener to taste if using. Let it cool until its warm. Strain and serve. I've never heard of turmeric milk, but I have read a lot about the healing powers of turmeric. I might have to try this next time I get sick! Stunning photos, as always, Kulsum. Not just for when your sick. I drink this at least twice a week still as a grown up (more out of habit) and my immunity and digestion levels are through the roof. I've been drinking "golden milk" daily for the past few weeks. I'm attempting to heal an issue but have been noticing other benefits as well. This might replace my morning cup of tea. Can you use almond/coconut milk instead? I made some just now with almond milk. Tastes great! Think I'll be doing this everyday. Almond milk should be fine but no coconut milk. Coconut is no good when it comes to cold, throat, cough issues. I swear by this stuff when I'm sick! Works like a charm every time. However, to those asking if you can substitute the milk, my grandpa has told me that it should always be mixed with hot milk because there is something in the milk (can't remember what) that allows the turmeric to be absorbed by your body. I have a recipe with coconut oil and honey, but I still get heartburn in the middle of the night... any suggestions? I would avoid honey - as a fellow heartburn sufferer, I also find that when I add grated fresh ginger to my recipe, it causes discomfort. This is most likely because honey is pitta aggravating (heat-causing) - and ginger, I have noticed, does not do well either, although touted as a digestive. I would recommend using plain, raw, brown sugar as a sweetner. Has anyone tried this? Make yourself a cup of hot cocoa in the usual wasy and add cinnamon and tumeric. You can also add ginger or chilli. Start with a little tumeric and increase the quantity over a few weeks - it grows on you. Gorgeous. I love the idea of cardamom in warm milk - might leave out the turmeric though, since no one's ill at the moment (touch wood)! This is great pass on information, thanks for posting. We did try the milk when our grandson was having a awful time with a cold and cough it eased his symptoms especially with the cough so he could sleep at night without coughing. Heat up the milk with some cardamom pods (broken) in it. Strain the milk and add some almond flakes. You could also add a bit of honey or sugar if you like it sweet.. It tastes awesome!! Thanks for the wonderful tips! i am suffering from severe flu and cough at the moment!! will try it now! That is an original and interesting drink! Your pictures are gorgous. i am loving the new feel of the pics..and the texture.. Absolutely stunning photos. I haven't had turmeric milk but you have truly piqued my interest. My favorite posts to read are the ones that detail heirloom recipes and time-honored home remedies. Yours is all of those things and beautiful to boot. Fav. during winter..can skip my cuppa for a hot glass of turmeric milk. Lovely clicks. It's so interesting to hear about different remedies from each culture. I remember my mother putting ground cloves on a tooth that ached; to this day I can't tolerate the taste. Lovely article! I could seriously do with a jug of this! I have such a bad cough and blocked sinus at the moment! Loving the textured photos. How interesting. I like putting turmeric in my dairy based smoothies. Never thought to have it with just milk! I am totally making this. Warm haldi-doodh at night, cold disappear by morning. Even used to hate kaada, don't know what others call it...but it had black peppercorns, tulsi, and lots of other stuff boiled in water, and it was sweet yet spicy yet strong at the same time. Drink it warm/hot & sleep if one has cold/cough/runny nose, and feel much better when wake up. I've heard the turmeric helps with joint pain so I was adding it to everything for a while. But alas, my knee is still in terrible shape! Maybe I need to try this instead! I told you right, this has become my family staple! So good! I've known of the health benefits but always wondered how to incorporate more turmeric into my diet, now I have this easy and soothing way! I love your turmeric milk! Wow what a great home remedy and with some of the most beneficial ingredients. So tell me, does it really taste that awful now that you're an adult or was that just when you were a child? I have all these ingredients on hand. I definitely want to try it. It can only help! Thank you for sharing this great information and recipe! This brings back a lot of memories. My sister and I, like other kids, resisted turmeric milk every time we were sick and mom would give it to us before we slept at night. But you are right - turmeric does help a lot. Good to see a humble drink on the blog. If turmeric is cooked in a dish, does it still have the same healing effect, or must it be used in it's "raw" form for optimal benefit? I ask because I had read one should mix olive oil and turmeric and take a spoon full of it daily. The thought of that isn't so appealing. Indians generally don't have turmeric powder raw. So yes, it certainly has healing properties even after it cooks. But fresh turmeric root has more benefits if that's something you can get your hands on. It has a very mild taste and works great in salads. I just had a cup of haldi milk this afternoon for my awful sore throat! :) Beautiful post! This sounds fabulous and potentially very useful. I am a cancer health educator/nutritionist with an international cancer charity and would like to share this recipe with interested patients and those on my cancer-nutrition courses. If it's okay with you I may include it in a future blog post, when I feature turmeric recipes of my own. Fully credited with link, of course. Glad I found you. Gorgeous images btw. Inspiring. What type of turmeric do u use? And where can u get it? Kulsum, I saw this post last night and guess what, I'm drinking your turmeric drink right now! I've been sick (cough and throataches) for nearly 2 weeks. This is something new for me but it's actually nice! Thank you for this post, it came in great timing! Hoping I'll get better soon with new remedy I have! I absolutely love your photos and I'll be studying your photos closely this year so I subscribed yours via email so I won't miss a post! Wish me luck...hehe. OMG Kulsum saw this post on FB & clicked in half of a second, something I have grown up with...this recipe is same as my grandma's. I drink it almost every winter night even when I am well :)...the taste is soo addictive..no? 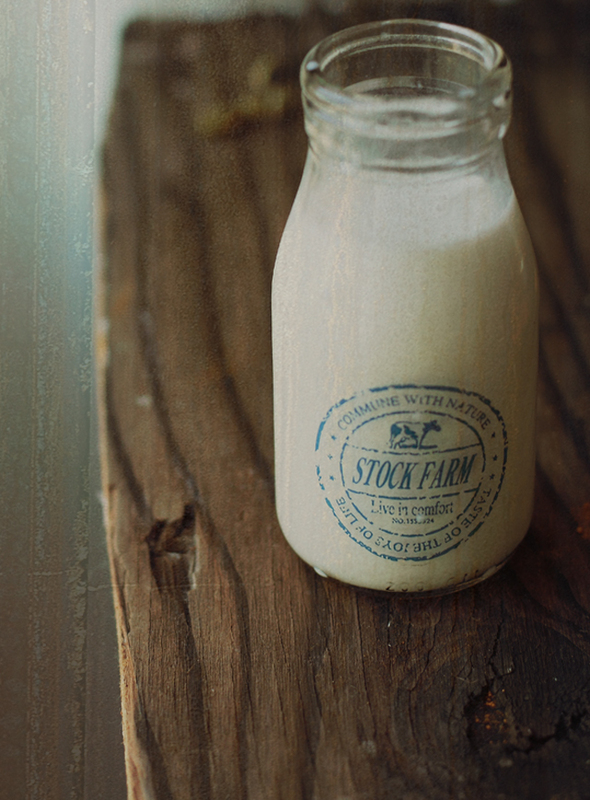 I want that stock farm bottle..courier it to me :) Gorgeous pictures!! Tanvi, don't put ideas in my head or else I have to ask you to courier props to me from Delhi! So glad to see your comment. I love turmeric and use way too much in curries. I'm am definitely trying this milk. I swear by an avocado, pear, garlic and ginger smoothie - but this is my new cure-it-all drink. I like turmeric, but I can't get it on my hands/skin...I turn red and super-itchy! I've never tried turmeric milk as a home remedy....we go honey-ginger-pepper as a remedy for colds in my family....but I'll try this next time. Simply flavorful and colorful milk. Awesome preparation. This looks wonderful! I experimented with turmeric-pumpkin milk this fall but haven't used this combination of spices. Can't wait to try it! hi kulsum,came here through pinterest and something meeta wolf had pinned ! and I am following you. If you make turmeric paste by boiling 1/4 cup of water with 2 tablespoons turmeric for 8 minutes, you can keep this paste in the fridge and use 1/2 to 1 tsp to make your milk. Just put 1/4 water with the turmeric paste, some cardamom, some black pepper, and some honey to a boil, add 3/4 cup milk, heat to HOT (not boiling) and drink. YUM! Thanks for the tip Annie! I have not found the need to store turmeric honestly but I think it would be a great thing to keep handy all through out winter. Well it looks like I came across this post at the perfect time. I've been fighting a cold for a few days & wondering what I could do besides the yucky OTC medicines. I may have to give this a shot...with a little sweetener, of course! I came across here from your pinterest. Turmeric is a great remedy and is able to keep our food to have a longer shelf life without any preservation. But turmeric milk is new to me. Thank you for introducing this to me. Lovely pics as always! Such a beautiful & healing milk. I actually have studied a bit of ayurveda & find it so honest & appealing. I like to share that my mum would also add grated NUTMEG to the boiling milk, tumeric, sugar and cardamom. I always like the flavor of this hot drink. I always wondered if this remedy only worked for South Asians (especially Indians). Any non-South Asians tried this remedy and did it work for you. Just CUROIUS. Hi Kulsum, I'm going to try this! I usually have a traditional turmeric, honey and tamarind drink which has been used for generations for internal cleansing. Adore the fantastic photos on your blog :) Well done! I am all in. I remember as a child getting borstrel (sp) and honey for a cough, and I am pretty sure it had turmeric. It was thick, black gooey but certainly tastes similar. The japanese drink cold turmeric tea for a healthy lifestyle. This looks good. This is not a medicine and I'm no medical expert. It is a simple home remedy that cures many of the basic day to day ailments but nothing more than that. Or at least that's all I know. I just made this. I didn't have cardamom but it tasted delightful with honey. I am feeling a tad better already. Just a hint, don't heat in a microwave (blows up!). Never use the microwave--it nukes all the vit. c! Kulsum, I have laryngitis and have no voice. My other half has just flown in from a long business trip from warmer pastures and is in danger of catching a cold. I made this tonight sweetened with honey. I had to put powdered ginger as I didn't have fresh. We both loved it. But I sympathise with you about the raw milk. I grew up in Pakistan and my grandmother would warm it and tell me age had strained it but it was so not true as the skin would catch and make me gag. The things we were put through as sub continental children!! I'm from the south part of India (Chennai) and this recipe is way too complicated. In my experience my mother, grandmother and great grandmother would simply stir in a 1/4 teaspoon of turmeric into one cup of milk and then warm the concoction together. With the convenience of a microwave, these days I simply warm things up for about a minute and you're good to go. The sweetness of natural milk masks any bitterness from the turmeric. I won't call adding few extra spices (which take seconds) easily available specially in an Indian household complicated :) But each to its own! take a half of a tea spoon of turmeric, a pinch of salt and warm water, gargle three to 4 times a day and the pain/discomfort of a sore throat is gone!!!!!!! turmeric is antiseptic and a pain killer!!!!! I discovered this amazing drink when staying with some friends in Mauritius. Not only does it keep your imune system and digestion in check, but it sure helps you sleep too. Thank you for sharing your recipe and pictures. Sounds delicious, looks delicious, tastes delicious! I tried your recipe out of my love of turmeric and non-caffeinated warm drinks. Unsweetened, it's pucker-inducing. I noticed some confusion in the comments here about what turmeric does. While I enjoy being a human guinea pig for delicious preventative remedy testing, it's important not to confuse traditional folk remedies, alternative/complementary medicine and other pseudo-science with science-based medicine. While there is preliminary research on turmeric and curcumin, they are unproven treatments. I'm particularly concerned by the poster who is promoting turmeric as a complementary cancer treatment. "Recent studies have even claimed it as substantial for curing diseases like cancer and Alzheimer's disease." I made this on Friday night and added some honey. It was delicious! Thanks! Do you get the same benefits mixing cold milk and tumeric powder rather than heating the milk and tumeric. Well since it is a cold remedy I don't see it as something I would have cold. An Indian friend told me about tumeric and milk today at the office. I had what I thought was the flu and was just about over it, but still had sort of a lingering cough. I made the tumeric and warm milk, drank it and it worked within a short period of time !!! I have not coughed since and I could tell that the source of the cough was eradicated !!! Just finished making &drinking this wonderful remedy for cough & cold. Can I ask how many times a day should I make this if symptoms are still lingering? Thank you. I am new to your site, however, I find it very interesting and informative. is it recommended to drink this at night - will it keep me awake? I am also new here. I grow turmeric. Can I use it fresh? How much? Thanks for the info. can't wait to try it. This brought back memories... It was compulsory to drink haladi-doodh twice a day everyday when I would have cold, cough or fever. I would hate the taste, still do but I know gargles in the morning and haladi-doodh are the best remedies.. I also remember those days when if you get a cut or a scratch while playing, first thing to do would be put turmeric powder on the wound..
We also make pickles with fresh turmeric roots, garlic cloves, chopped carrot and many other things! Ahhh!!! hardar nu dudh as it is known in Gujarati is something we drank whenever we felt a cold coming on. Your recipe is mild compared to what I grew up with. We had 1 to 2 TABLESPOONS of turmeric in just ONE cup of milk. You can imagine how bitter that was. And to top it off my mom would make us swirl the cup when we nearing the bottom so that any settled powder would not be wasted. It always worked. I love Ayurvedic remedies! I will look forward to this a mid-day break! Thank you for sharing and beautiful photos. I made mine with unsweetened almond milk, ground turmeric, ground cardamom, ground ginger and pepper with a bit of honey. It's delicious! Your blog is absolutely beautiful and a learning experience for me. I hope to visit it often. Thank you Karen. So glad to know your enjoyed it. I have been using turmeric powder in milk without boiling it. Is it fine or do I have to boil it to gain benefit from it? If its for cold its best served hot! Just a pinch per serving. Cardamom can be overwhelming otherwise. Hi, does anyone have an alternative for this remedy without anything milk or milky like? Please remember I'm no medical expert and this is a general home remedy but as far as I know you shouldn't be feeding anything but breastmilk/formula until 6 months! I remember my mom giving us this even when we fell down as turmeric helps with healing. Hated it at the time :) She would also make an omelet with salt, pepper and added turmeric just so we would eat it. I've never used it but your post just made me try some. Brings back memories. Thanks Kulsum. Hi Kulsum!! I'm so happy to see this... even though you posted this last year..... It's my first time seeing this off of pinterest, my ? is can I do this if I'm nursing my 7 mo. old? Thanks Kulsum. I'm no expert but I see no reason why you can't! Happy day! made up my own turmeric milk after a discussion with and friend from India and added cardamom and ginger off the top of my head but no black pepper. I shall enjoy making this more often as I have hopes it will ease some joint pain as well. Thank you. I love turmeric, always add it to veggies, soups, etc. But now, I'll also drink it, both with milk (I use soy or almond milk) or in tea. I was buying prepared masala tea mix, but yes, much cheaper to use your own cardamon & ginger. What a powerful drink! Thank you for this easy, healthful recipe. Just repinned on Pinterest, that's how I found it. 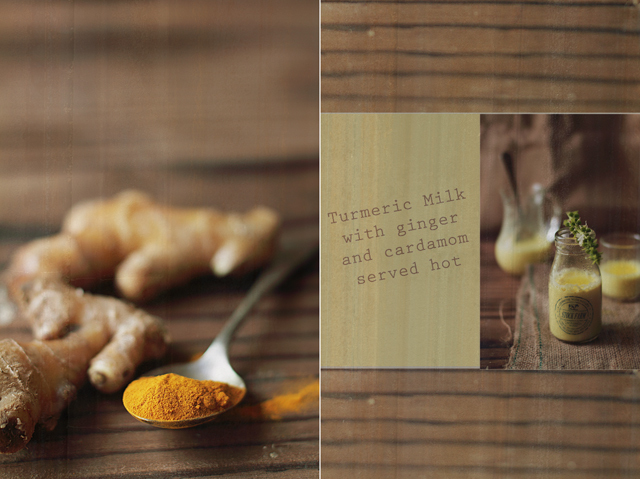 I've used a similar turmeric milk recipe for years for aches and pains. I call it Golden Milk, and it is a simplified version where I make a decoction of the powdered herb by boiling a couple tsp in a cup of water until it reduces to half, then add honey and milk. I find it works great for joint inflammations especially when combined with a turmeric compress (powdered turmeric sandwiched in a cloth soaked in hot water) over the affected area. This method targets the inflammation from the inside and out! I forgot to mention: Beautiful photos! Thanks a lot. This helped a lot with my toddler's mucus. 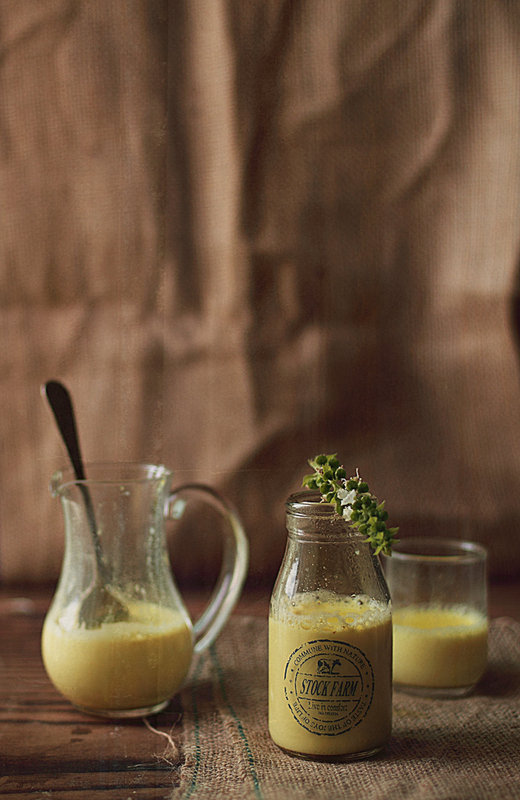 Beautiful blog about Turmeric milk. Now a days we have been suffering from many diseases due to pollution and also have been spending too much of money for the health, why don't you drink home remedy turmeric milk instead of drinking coffee, tea, supplement health drink etc. Turmeric milk becomes very necessary part for the family, children, students and our younger generation. I know that turmeric is an anti-inflammatory and helpful in alleviating pain. Also studies have shown it may help to prevent cancer. Didn't have the cardamom but made it anyway with almond milk and it was delicious!Thank you. Now I applied a moist hot,turmeric added,towel to my arthritic knee to see what the affects will be. Thanks to everyone, I have been looking for something to help break up the 'crud' that I have. Looks as though this could be it. I don't have the cardamon pods so would it be acceptable to use cardamon powder? Another great recipe for colds is ginger tea. Simmer a finger of ginger (peeled and minced) for 5 minutes or so then just before you drink it add fresh lemon juice (1/2 lemon to a cup) and honey. Sip on it throughout the day and it will shorten your cold symptoms. Hi Kulsum. if i simply mix powdered turmeric in hot milk rather than cooking them together will it have the same effects or is it important to cook them? Hi Tania - from what I understand, turmeric is easier to be absorbed by the body when heated so I think heating it together is the way to go. Thank you so much for the great post. I have been suffering from a cough for weeks and have been looking for something natural to get it gone for good. I cant wait to try this recipe tonight. Is this meant to make fresh, or can you make a batch and heat up? I'm using almond milk and added a couple of Tulsi Red Chai Masala tea bags. Tastes great. Hope it knocks out this horrific flu bug. My husband and I are suffering from sore throats,so I made this tonight and it really does work! Thank you so much for posting the recipe. Would you mind if I shared the recipe on my blog, HomemadeMothering? Are the benefits the same if mixed with cold milk? Hii... your recipe is really wonderful and no doubt its a very beneficial for health, recently i have throat infection i made this with my best cow milk brand, Pride of Cows ad its works very well. 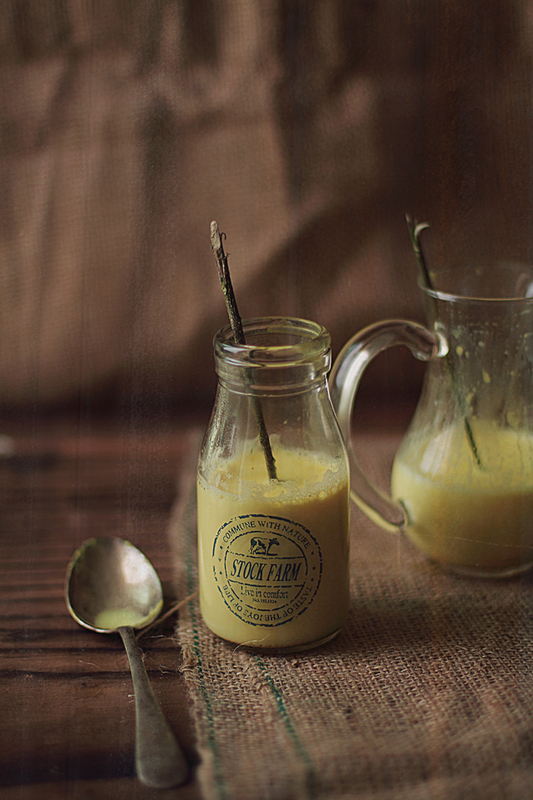 Thanks for sharing such a beneficial recipe of Turmeric milk. Its amazing,simple & one of the best healthiest drink! These are so Instagrammable and adorable! I'm also gonna pin this post on my Pinterest board my followers will love it. Thx for sharing!